The other day I was reading one of my favorite blogs Max The Quilt Cat and was thrilled to read that "HH" who if you didn't already know, happens to be a super talented painter as well as a genius writer, is participating in a 30 Paintings 30 Day Challenge from the Leslie Saeta blog. HH chose "Cats" as her theme for the challenge, and soon after beginning her paintings she realized that she needed more photos of cats to paint. She posted a request for more cats on her blog and I was all over it!. There is nothing I love more than original art, I have a deep appreciation for it, and the time it takes to create it, since I draw and come from a family with a heavy artistic influence. So, I submitted this photo of Cody. This is one of my favorite photos because it shows the gorgeous green of his eyes. HH emailed me yesterday with the finished product, and gave me the option of purchasing it at a discounted price. Here is the painting, done in an "impressionistic" style, and I am completely in love with it!! Thank goodness HH accepts PayPal! I purchased the painting and cannot wait for it to arrive! When it does, I will photograph it again after it is proudly displayed on the wall. Would you like a painting of YOUR cat done by the incredibly talented HH? 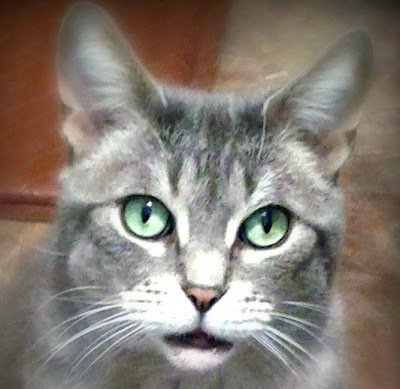 All you have to do is email her a jpg photo (close up is best so she can see the eye color of your kitty). Email her at: MaxTheQuiltCat at gmail dot com. You can refer to her blog for more details here. I am completely in love with this painting of my precious Cody, and I can't wait for it to arrive!! It looks awesome! And looks just like Mr. Cody too. I also didn't know that you draw! I saw that earlier - it is awesome! My human is a big art fan too. She has several paintings by local artists... and a small Xavier Cugat oil! Love the style...and I love how she emphasized Cody's whisker humps! I may just have to peruse my Katie shots! I just saw it in MaxTheQuiltCat . It is Pawsome ! We saw that. Cool one. Just like you Cody. Have a wonderful Wednesday. What a pawsome painting of the Codester! Captured those green eyes and the expression so well.....I like the style of the painting too - real talent can capture the essence in few strokes. Well done HH and concats Miss Caren for getting a lovely portrait of your boy for the wall! This is so beautiful! Lou perfectly captured Cody's sweet face. What what a beautiful job. HH did an amazing job, but then again, look at the great subject! We love it, Caren, she did a wonderful job. And how cool that you've purchased it! We can't wait to see, perhaps framed and hanging somewhere special! That is such a good painting of Cody. We saw it over at Knuckles and Bugsy's blog. HH does such a good job of painting.We sent her a picture of Two Two. Hope all of you have a great job. Cody is beautiful & the painting is just purr-fect! Thanks for sharing! Lou you totally deserve it!! I can't wait for the painting to arrive!! ((((hugs)))) back! 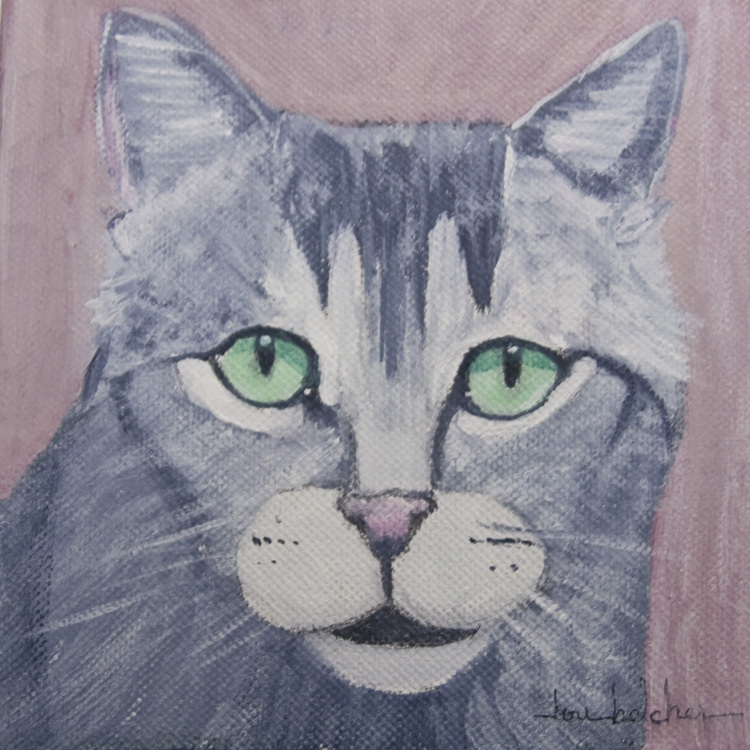 I love Max, his brofurs, his blog and HH's great paintings!! I love this painting! Glad you were able to purchase it! Wow! That definitely looks close to the real thing! That is a very nice painting. She totally captured Cody, which in turn captured your heart. It looks great! It will look so nice in your home. That's lovely! We hope the painting arrives really soon! Too cute! I love drawing cats. They are so beautiful and graceful. great painting of Cody,I bet you can't wait for it to arrive? yep Speedy I am super excited! That's beautiful! We don't blame you for purchasing it. I am sure she will! Can't wait to see! Wow, that is so cool! We submitted pictures of all of us. We hope HH paints at least one. Fabulous! I can't wait to submit photos of Gracie and Benjamin Bunny. Cody's portrait is wonderful. He must be so proud. Thanks for your "Likes" on the new Facebook page. I think I fixed the comment issue. You are a wonderful mentor! Awesome art and lovely kitty as well. thank you so much. He is a good boy! she most certainly did! Ohhhh I can't wait to see the painting of Moosey!! How wonderful!!! We'll have to check it out. We haven't visited their blog before. That is a really nice photo & painting of Cody. We love his eyes in them too. So happy you are going to check them out Oui Oui. HH has a wonderful blog and I reviewed her book on Cat Chat some time ago. I just love the photo and the painting too! Cody is very handsome and his eyes are a very unusual shade of green. Actually the blog background was picked at least a year before that photo was taken, maybe 2 years since we are now blogging 3 years. I couldn't believe it when I saw that it matched! What a lovely painting! The photo is gorgeous, too. Purrrrrrrrrrrrrrs. Love it, how special is that!